Heavily focused on the new genres of genomic and cellular oncology treatments, the one-day University of Pennsylvania "Cost of a Cure" conference convened top experts for a dialogue around one of the most controversial topics in medicine today: the record-breaking costs of the revolutionary new drugs and therapies. Organized by the Leonard Davis Institute of Health Economics (LDI), the event was co-sponsored by Penn Medicine's Abramson Cancer Center Cancer Control Program, The Penn Center for Cancer Care Innovation, and the JED Fund. Operating under Chatham House off-the-record rules designed to encourage frank discussions, 23 of the country's top precision medicine experts from academia, government, and business interests, including pharmaceutical marketers, venture capitalists, insurers and biomedical entrepreneurs, participated in the panels. The invitation-only audience consisted of a similar mix of top academic medical center researchers, business interests and government officials. Cost, profits and affordability were key themes. 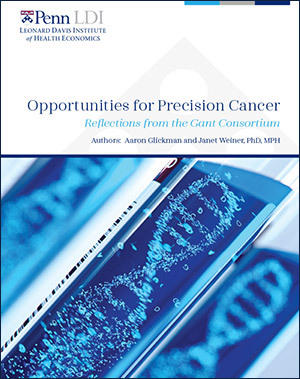 Precision medicine's current extreme prices were noted as a major issue by most speakers; others predicted that miracle curative drugs and therapies currently in the pipeline toward FDA approval were likely to be launched at prices as high as multiple millions-per-treatment. One area of debate addressed the suggestion that a new "annuity" or long-term mortgage-like financial model was needed to enable marketers and investors to support such million-dollar pricing. Government speakers questioned whether such costs were sustainable in publicly-funded provider systems already stretched to the financial limit. One oncology expert noted that the current break-through therapy that dominated the day's conversations -- the Penn-pioneered CAR-T cell therapy that cures Pediatric Acute Lymphoblastic Leukemia -- is only one sub-type of immune effector cells (IECs) being tested for the same potential in other cancers. The expert asked the audience to imagine the cost and access implications if an IEC therapy that can cure non-small cell lung cancer (the most common type of lung cancer) was perfected and approved by the FDA. He characterized the current situation and debate as "the first rain drops of the coming tsunami." 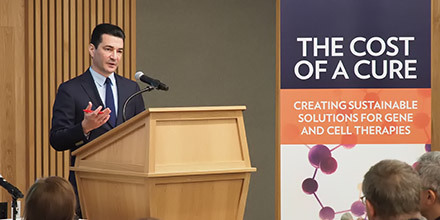 FDA Commissioner Scott Gottlieb (above, left) told the audience that current payment models needed to evolve to ensure a balance between proper incentives for manufacturers and accessibility for patients. He emphasized that emerging genomic and cellular technologies are not aligned with the current models for developing and paying for medicines. He said if this does not change, the pace of innovation may suffer and opportunities may go unrealized. Above, right, at a private lunch, Gottlieb, University of Pennsylvania Health System CEO and LDI Senior Fellow Ralph Muller, and the Penn Medicine leadership team discussed ways the two institutions could work together more effectively. In comments opening the conference, Perelman School of Medicine Dean Larry Jameson, MD, PhD, (above, left) noted when he came to Penn in 2011, it was clear Penn's biomedical researchers were on the brink of a revolution in immunotherapy. Over the next seven years, he watched that promise become a reality that catapulted Penn Medicine to international acclaim for its stunning cancer-curing breakthroughs. He said it could be argued that the new science of genomic and cellular immunotherapy may be medicine's greatest achievement since the development of vaccines. The rapid ascent and perceived importance of these new therapies is also evident in the fact that the very first class attended by this year's incoming students at the Dean's medical school was on gene-based therapies. Above, right, Ke Liu, MD, PhD, the FDA's Acting Associate Director for Oncology Cell and Gene Therapy, gave a presentation during the "Innovation" panel session. 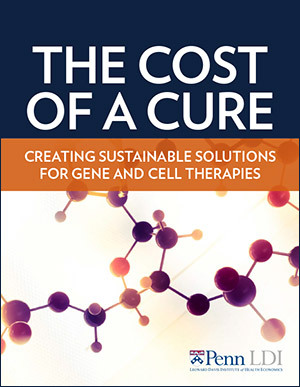 Planning for the "Cost of a Cure" conference, explained LDI Executive Director Daniel Polsky, PhD (above, left), began late last year in the wake of the FDA's approval of the first gene therapy. Developed at Penn, that CAR-T therapy -- Kymriah -- uses a patient's own re-engineered immune system T cells to attack the cancer. The four LDI Senior Fellows who co-chaired Conference planning were Polsky; Justin Bekelman, MD, Director of the Penn Center for Cancer Care Innovation at the Abramson Cancer Center; Steven Joffe, MD, MPH, Professor of Medical Ethics and Health Policy at the Perelman School; and Abby Alpert, PhD, Assistant Professor of Health Care Management at Wharton. Above, right, participating in the "Ideation" panel are Carl June, MD, Professor of Immunotherapy, Director of the Center for Cellular Immunotherapies at Perelman School of Medicine, and leader of the team that developed the CAR-T therapy now marketed as Kymriah by Novartis, and Bekelman. Moderating the "Innovation" panel was Rachel Sachs, JD, MPH (above, left), Associate Professor of Law and Health Law at Washington University in St. Louis. Above, right, providing a state government perspective was Mandy Cohen, MD, MPH, Secretary of the North Carolina Department of Health and Human Services and former Chief Operating Office and Chief of Staff at the Centers for Medicare & Medicaid Services (CMS). Above, left, is Steven Joffe, MD, MPH, Professor of Medical Ethics and Health Policy at the Perelman School of Medicine and LDI Senior Fellow. Above, right, speaking on the "Innovation" panel was Salveen Richter, CFA, Vice President and Senior Analyst for Biotechnology Equity Research in Global Investment at Goldman Sachs. Commenting on the "Innovation" panel was Jeff Marrazzo, MBA, MPA (above, left), the CEO of Spark Therapeutics, a commercial gene therapy company that began as a research center within Children's Hospital of Philadelphia (CHOP). Last year, Spark received FDA approval for the first gene therapy for a genetic disease. Above, right, also speaking on the "Innovation" panel was Stephan Grupp, MD, PhD, Director of the Cancer Immunotherapy Program at CHOP. Fielding questions on the "Price and Affordability" panel (above, left) were Anand Shah, MD, MPH, Chief Medical Officer at the Center for Medicare & Medicaid Innovation; Jennifer Malin, MD, PhD, Senior Medical Director of Oncology and Genetics at United Healthcare; Liz Barrett, MBA, CEO of Novartis Oncology; and Rena Conti, PhD, Associate Research Director for BioPharma and Public Policy at Boston University. Above, right, asking a question from the audience is Perelman School of Medicine Professor and LDI Senior Fellow Jalpa Doshi, PhD. Vigorous debate and discussions throughout the breaks and hallways of the conference were the order of the day. Above, left, Ezekiel Emanuel, PhD, MD, Chair of Medical Ethics and Health Policy at the Perelman School of Medicine and LDI Senior Fellow, makes an emphatic point with Spark Therapeutics CEO Jeff Marrazzo. Above, right, Perelman School of Medicine Research Assistant Professor and LDI Senior Fellow Genevieve Kanter, PhD, engages Ke Liu, MD, PhD, of the FDA's Oncology Center of Excellence. Speaking on the "Pricing and Affordability" panel was Steve Pearson, MD, MSc (above, left), President of the Institute for Clinical and Economic Review (ICER), a non-profit that evaluates evidence on the value of medical tests, treatments and delivery system innovations. Above, right, addressing the same panel from the podium was Jennifer Malin, MD, PhD, Senior Medical Director of Oncology and Genetics at United Healthcare. Discussing the issue of access to gene and cell therapies for all patients was panelist Peter Bach, MD, MAPP (above, left), Director of the Center for Health Policy and Outcomes at Memorial Sloan Kettering Cancer Center. Above, right, also participating in the "Access" panel was Madan Jagasia, MD, MS, Professor of Medicine at Vanderbilt University Medical Center Department of Medicine, Division of Hematology-Oncology. Speaking on the Innovation panel was Bhaven Sampat, PhD (above, left), Associate Professor of Health Policy and Management at Columbia University Research Institute and Research Associate at the National Bureau of Economic Research. Above, right, asking a question from the audience was Jeff Voigt, MBA, MPH, Principal at Medical Device Consultants, LLC, former President of the Wharton Healthcare Management Alumni Association (WHMAA), and a member of the LDI Executive Advisory Board. Hoag Levins is the Editor of Digital Publications at the University of Pennsylvania's Leonard Davis Institute of Health Economics (LDI), and a former staff reporter and editor at newspapers and magazines in Philadelphia, New York and Washington, D.C.